Norway-based Photocure has secured approval from the US Food and Drug Administration (FDA) for new drug and device combination to detect bladder cancer. Photocure’s supplemental new drug application (sNDA) has been approved to expand the indication for Blue Light Cystoscopy (BLC) with Cysview to include flexible cystoscopes, which are used in the ongoing surveillance of patients with bladder cancer. The expanded indication covers the combination of Cysview with the Karl Storz PDD flexible blue light videoscope system. The approval for new indication was based on the results of a phase 3 study, which used Karl Storz blue light enabled rigid and flexible cystoscopes. FDA approval also extends the indication in the current rigid setting (TURBT) by including the detection of carcinoma in situ (CIS) in bladder cancer patients, in addition to the repeated use of BLC with Cysview. Photocure, along with Karla Storz Endoscopy-America, is planning to introduce Cysview in combination with blue light enabled flexible video cystoscopy in the middle of this year. 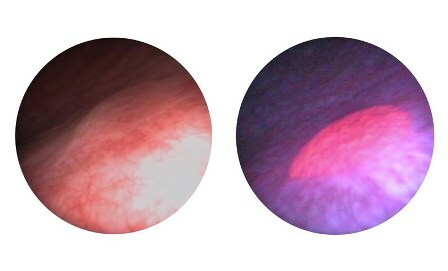 Hexvix/Cysview is a drug that will selectively absorbed by cancer cells in the bladder, and turns them to bright pink color during Blue Light Cystoscopy (BLC). “BLC with Hexvix /Cysview enhances the detection of tumors and leads to more complete resection, less residual tumors and better management decisions,” Photocure said in a statement. Photocure president and CEO Kjetil Hestdal said: "This approval is an important milestone for Photocure. With 1.2 million surveillance cystoscopies performed annually in the U.S., this represents a significant opportunity for the company and allows us to bring solutions to current clinical challenges. "The expanded label now allows repetitive use in the same patient which enables physicians to provide an improved continuum of care to their bladder cancer patients and should lead to reduced cost." Image: Blue Light Cystoscopy (BLC) with Cysview. Photo: courtesy of PRNewswire / Photocure ASA.